Mi Casa del Mar is one of the most beautiful properties in Akumal. It is ideally located between Akumal Bay, a sandy white beach and fun snorkeling area - and the Half Moon Bay. Check our reviews ! The condo is in a lovely building, with unique, bold architecture with beautiful hardwood doors and cabinetwork, tile floors, tile counters, high ceilings and other upscale features throughout - and a private atmosphere that makes it a great vacation retreat. We are an easy five minute walk to the soft sand beach, shops and restaurants of Akumal and a five minute walk in the other direction to Half Moon Bay which is a bit pebbly, but has a nice bar and restaurant ! We don't have the "sargasso problem" that the building on Half Moon Bay are experiencing now. Our first floor garden level condo is close to a beautiful infinity pool with a breathtaking view of the Caribbean Sea. The condo features beautiful tile-work including a newly tiled kitchen and unique artistry in the floors walls and high ceilings. It has two bedrooms with King Size beds and AC, with two full baths. We have a futon couch and a large sofa in a large, spacious living area with stools to pull up to the kitchen counter from the living area side. Spacious, beautifully decorated with talavera tiles artwork and lamps, meticulously maintained, our condo sleeps 4 adults and 1-2 more family members on our new futon couch and/or 1-2 more children on our built-in sofa. A beautiful dining area, fully equipped kitchen, and a furnished patio with walk-out to the pool, complete our five-star retreat. We have many returning guests. Our condo is a favorite for families with kids and for vacationing couples or two couples. We have daily maid service. We go the extra mile and have Wifi internet, a TV, a large DVD movie collection, a CD player. To save time, money and trouble for guests we have snorkeling equipment including 4 life vests (required here) six snorkel sets including kids sizes, and flippers of all sizes. We even have a crib and high-chair for your toddler. Within 25 feet of the first floor patio is a beautiful Infinity pool with inlaid mosaic turtles and a wading area in front makes the pool kid-friendly as well ! There are lawn chairs, and a hamaca outside. Beach towels, hair-dryer and iron . Air Conditioning in bedrooms which each feature King Sized Beds, Two Full Baths. Gentle ocean breezes keeps the interior comfortable for extra guests and children on futon in LR. The living area includes two convertible sofa couches in a spacious area with Mexican tile floors and a newly added futon couch. Outdoor dining table on the patio. Full kitchen, microwave, toaster oven, refrigerator, cooking utensils and purified water provided, dining service for 8, daily maid (except Sundays), linens, soap and towels and huge beach towels are provided. Hair dryer, iron and board, extra pillows. Pets are not allowed (sorry !) Free parking available. Mi Casa del Mar is ideally located between two near-by beaches: Akumal Bay - a swimming beach with beautiful soft, white sand near the town of Akumal with great restaurants, food stores and cute little shops, - and Half Moon Bay, a snorkeling bay with coral reefs (but has a pebbly beach), a great beach restaurant, and dive shop. Both beaches are within five minutes easy walking distance. The the fabulous Yal-ku lagoon for snorkeling is a ten minute walk away. Mi Casa del Mar is close to the town of Akumal that offers many activities, shops and restaurants. Food and amenities can also conveniently be purchased in Akumal. Be active and explore, or spend your vacation relaxing on a beach or relaxing next to the pool as part of the beautiful view at Mi Casa del Mar. Akumal is a quiet retreat located in the Mayan Riviera and is famous for snorkeling (Yal Ku Lagoon), excellent scuba diving, deep sea fishing and many other activities. It is in ideal proximity to the ancient Mayan ruins of Tulum and Coba, eco water parks Xel Ha and Xcaret, breath-taking cenotes (water caves), and world famous Playa del Carmen, the ultimate nightlife and shopping town, and many fabulous beaches and snorkeling and diving sites. The area is ecologically famous for its sea turtle nesting grounds. (Akumal means 'place of the turtle'). The location is in an ideal location for not only getting to spots in Akumal on foot - but it is a great location to see all of the sights and sounds of the region including experiencing Cenotes, the water parks like Xel Ha, archeological sites such as Tulum and Coba, a monkey preserve at La Punta Lagoona, and the town of Valladolid which has a scenic cathedral, wonderful shopping and an awesome folk art museum called Casa de los Venados. For more adventures you can drive 3.5 hours to the Mayan ruins of Chitzenitza or our favorite, Ek Balam. We are both professional scientists. Hans works in the area of cancer imaging agents and Joan is a specialist in intellectual property management. We take pride in our ability to help you have a great vacation and have compiled five notes including; 1. places to see and things to do; 2. directions, shuttles and rental cars; 3. cooking a shopping in Mexico, 4. a restaurant guide for Akumal (our own reviews ! ), 5. "last minute stuff' about what we have like beach towels and much more, and 6. rules of the building (no Spring breakers, please - it is a quiter building where half of the condo's are not rented). We loved this property at first site ! We looked at seven condo's in Akumal and when we saw this one we looked at each other and smiled ! The building is unique and different than all of the other buildings in Akumal. The condo's are spacious. The pool is one-of-a-kind, an infinity pool that is the most beautiful in Akumal ! View more about Hans S./Joan P.
First full bath in master bedroom, Second full bath is off hallway. The bathroom is beautifully tiled and decorated with full stand-up showers and built in tile seat in hallway bath shower for handicapped persons. Our first floor condo requires only walking up our entry way steps which are broad and pictured on our web site. While our poos is super convenient, we urge families with children to note that none of the pools in Akumal have fences requiring a watchful eye on the little ones ! Our kitchen is fully equipped by the best cook in the world with all kinds of kitchen amenties and sets of glasses for your favorite drinks! Akumal Bay is 0.5 km in one direction, Half Moon Bay is 0.5 km in teh other but can be a bit "pebbly". Two beaches within easy walking distance. The property overlooks the beautiful Caribbean ocean, viewable from the sliding glass doors. The property has a stunning 180 degree view of the coastline. Beautiful sunrises, sunset colors (sets on opposite horizon but castes beautiful colors and moon-rises to die for. The condo is between two beaches, Akumal Bay which has the nicer sand and better snorkeling (including turtles) and Half Moon Bay which is scenic but the beach is "pebbly". Complete dining set for more than 6. Numerous types of glasses for drinks. Outfitted by a gourmet chef - my wife ! We have a complete set of cooking pots/pans and all kinds of extras like a blender and magic bullet. Many sets of dishes and glasses including plasticware. We have disconnected Cable as it was 90% spanish stations and difficult to operate. Use our Netflix or connect your HDMI device. Ideal for families, couples, and seniors. First floor condo access from patio or entry door. Our kitchen is fully equipped by the best cook in the world ! 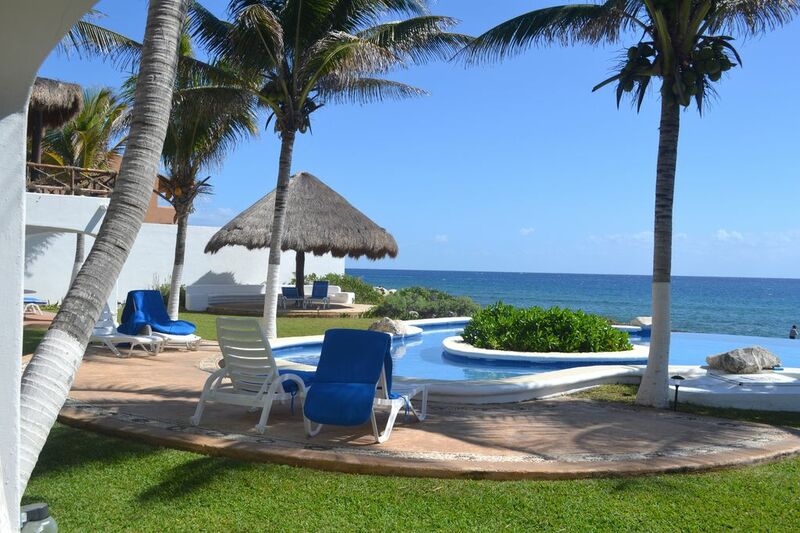 Our condo is one of the most spacious 2 BR condos in Akumal. We urge families with children to note that none of the pools in Akumal have fences requiring a watchful eye on the little ones ! Half the pool is a wading pool and the other half is deep for adults. We have a library of movies on DVD for young and old. We have an assortment of snorkeling equipment for adults, teens and children as well. Lovely ocean front condo! Fully equipped kitchen and comfortable beds. Great location and walking distance to many restaurants. Thanks Paul, and thanks for informing us of several things that needed attention. You were very helpful to us as well ! Glad you enjoyed it. Couldn’t ask for more! Accommodations were wonderful! Condo was well equipped and clean. Gloria was great. View, pool and privacy were super as well as other guests/owners. Also loved location and restaurants - not much else but hope to be back! Thanks very much. We're very happy you enjoyed your visit ! We loved this condo and all the amenities. Equipped with everything you need and daily maid service. The view of the ocean and the infinity pool just out our door. Will absolutely go back again. They owners are also wonderful people. Thanks for your warm note. It's wonderful to have so many wonderful people stay in our place ! We had a very good time. The Accommodations were wonderful. It is a great location for accessing the restaurants and beach at Akumal Bay. We did find it challenging to access the beach at Half Moon Bay. The pool, condo amenities, staff and views were outstanding. Locations was perfect—close to town and restaurants. The info the hosts provided on the condo and area was very helpful. Thanks ! Please let us know how we could have been even better ! Hans S.
We were very pleased with this Condo, being in the first floor was a blessing since my mother can’t climb stairs. Very clean and comfortable, I was expecting two full size beds on the second bedroom instead of a king size bed but we used the futon mattress and that fixed the problem. The hammock was used nonstop, we were able to relax and had amazing pictures of the sunrise. It needs a little update but I’m not picky, I loved it and will rent it again next year. Thanks ! We're happy you had a nice time. We are actually updating the entire kitchen with new tile, new sink and faucet in September ! An easy one-hour drive south of the Cancun airport will get you to one of the world's most beautiful vacation locations in Akumal. Mi Casa del Mar is ideally located between two near-by beaches: Akumal Bay - a swimming beach with beautiful soft, white sand near the town of Akumal with great restaurants, food stores and cute little shops, - and Half Moon Bay, a snorkeling bay with coral reefs, a great beach restaurant, and dive shop. Akumal is a quiet retreat located in the Mayan Riviera and is famous for snorkeling (Yal Ku Lagoon), excellent scuba diving and many other activities. An easy drive takes you to many fabulous beaches, eco water parks Xel Ha and Xcaret, and breath-taking cenotes. Akumal has ideal proximity to the ancient Mayan ruins of Tulum, Coba, Ek Balaam and Chitzenitza.. The area is ecologically protected and famous for its sea turtle nesting grounds (Akumal means 'place of the turtle'). Internet is available in our beautiful building. Eco: In the summer months night walking tours are available close by to watch turtles come on beaches to nest. It is a very special place. Additional information, pictures and web sites are one request away ! We have been known to be flexible regarding cancellations and refund fully for hurricanes and proven medical situations.